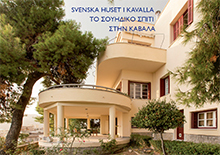 The Editorial Committee of the Swedish Institutes in Athens and Rome (ECSI) publishes the Opuscula and the monograph series of the Swedish Institute at Athens and the Swedish Institute in Rome. The Committee consists of members representing the universities of Göteborg, Lund, Stockholm and Uppsala and the Swedish Institutes at Athens and Rome. The Editorial Committee is advised by an International Advisory Board of prominent scholars within fields spanning the full thematic scope of the series and the journal. Jenni Hjohlman, The Editorial Committee of the Swedish Institutes at Athens and Rome, Department of Archaeology and Classical Studies, Stockholm University.